As discussed in our previous blogs, the Monsoon "reversal" schedule seems to have commenced, from where it should, Pakistan region and in India, the extreme west of Rajasthan. "Vagaries" had anticipated the widhrawal to commence from the 15th. of September. As on the 15th. the most important and obvious parameters of monsoon reversal are seen. 1. The 200 hpa jet streams. This has been explained earlier, and now is clearly seen as a westerly stream all over the Pakistan region, and somewhat into western Rajasthan. 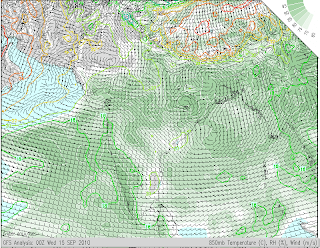 During Monsoons they are easterlies, as they are below the 25N line. 2. A well defined anti-cyclone in the areas pertaining to the widhrawal.And much less humidity (grey shading) in the regions where monsoon is retreating. indiacates higher values ver the western region of India and neighbouring Pakistan. "Vagaries" would consider the monsoon as over from Pakistan (save coastal sindh, adjoining India's Kutch region) and western most regions of Rajasthan from today, 15th.September. The next areas, which would normally come in the widhrawal stage wuld be Kutch and Saurashtra, and rest of Rajasthan State. When ? Most probably around the begining of next week, say by the 20th.of September. But another appraisal of this second phase on Friday. Regarding the current low as discussed on Tuesday, it seems what was predicted will hold good. The low being originally at 1002 mb, was thought to be too weak to carry on inland as a MSL low. As envisaged, should track inward as an UAC. The path ? Thru North A.P./East Vidharbha on Thursday, and into M.P. and South U.P. on Friday. But, the heavier rains will actually be precipitating once the UAC establishes itself over M.P. by around Friday, or a day later on Saturday. Rains in Delhi and west U.P. on Friday/Saturday. And , if the W.D. predicted by IMD for Friday comes thru, the inter-action of the 2 systems will produce very heavy rains. 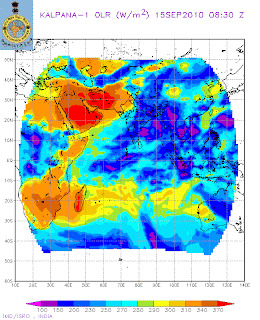 The regions of heavy rains on Saturday could well be Delhi or Utteranchal or H.P. Let's guess that once the W.D. arrives. It had become quite dark here at Andheri too around 1:30 pm, the lightning map showed one small dot from the time period that you mention the Thunder was heard. It did not thunder nor did it rain though in the suburbs. Right now it's become quite bright with blue patches visible as if to allow the 'Gauri visarjan' to happen peacefully. By the way as on 16th Sept. what's your opinion on the record for Colaba this season? Will it break - will it not?